LEAVENWORTH, Kan. — Leavenworth's Business and Technology Park is now open for business. The park sits on 82 acres on that city's south side off of Eisenhower Road. It's come with a price tag of nearly $10 million taxpayer dollars. The park has been graded, has completed roads and sidewalks and the utilities are all in place. It was done that way to make it "shovel ready" for a business to move there and put up a building. So far, the only thing missing is tenants. "We hope to have somebody as soon as we can, hope to get the right tenant in there," said Paul Kramer, Leavenworth City Manager. The 41 Action News Investigators first reported concerns about the park last year. In a series of emails to Leavenworth County Commissioners, County Administrator Mark Loughry noted the money to build the new park came from a sales tax voters specifically approved for three road projects, not the industrial park. Loughry also expressed concern because the plan set up local real estate developer Mike Reilly's property as the only option. But Leavenworth County Commissioners approved the deal anyway by a 2-1 vote with only Commissioner Bob Holland voting against it. Under terms of the deal, the city of Leavenworth took possession of the property in June after paying Reilly and his company JMK Partners well over $9 million. Specifically, the city paid Reilly $1.2 million for the land and another $7.95 million to develop the land into a shovel-ready industrial park. The city is holding onto the last $20,000 of the deal pending completion of fall grass seeding. When the 41 Action News Investigators spoke to Reilly in April 2017, he said, "It's a huge gamble anytime you're investing in your community with infrastructure, with utilities or with a business park." When the 41 Action News Investigators recently spoke to Kramer and noted Reilly and his partners have been paid their money whether the park is a success or not, Kramer replied, "Yeah, they've fulfilled their contract to turn over a turnkey park to the city." Additionally, Reilly is benefiting from a 12-inch water main the city utility extended at a cost of over $300,000 to customers, but free of charge to the city. Reilly is building homes just north and west of the park and has already paid to hook up to that extended water line for several homes. "Their board voted to actually perform the work for the good of the community," Reilly said in April, 2017. One of the driving forces behind the industrial park project was Greg Kaaz. Kaaz was part of the water board which voted to put in the water line. Kaaz originally voted to have the utility look at extending the water line, then abstained in the final approval vote. Kaaz's company Lexeco was a subcontractor for Reilly on the industrial park deal. 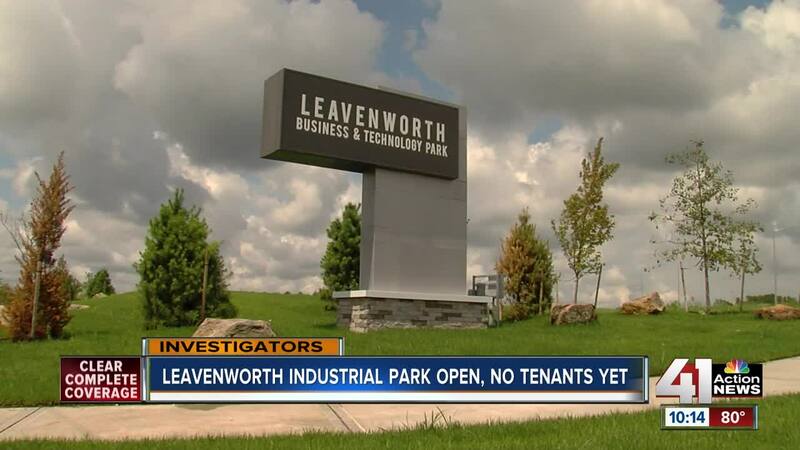 Since the city of Leavenworth took possession of the industrial park in June, representatives from two undisclosed machine manufacturing companies have come to the park for site visits. But ultimately, they decided to go somewhere else. Now there's a third company in the very early stages of the process which could potentially take 50 acres of the 82-acre park. "If we get more of those visits and can land one in the next year, 18 months, then I think that will be a short-term success," said Steve Jack, Leavenworth County Development Corporation Executive Director. That organization, LCDC, is charged with promoting business opportunities in Leavenworth County. But community leaders know there are no guarantees. A $7,500 study by Kansas City real estate consulting firm Newmark Grubb Zimmer found in order to be competitive, Leavenworth will have to give free property taxes for 10 years or longer to major potential tenants. The firm also recommends sweetening deals with other incentives like reduced utility rates to stand out from competitors. And the firm recommends the city hire a broker to recruit businesses for the park. A broker would be paid a commission only if a company signs a deal for industrial park space. "There are some adjacent communities that have built industrial parks and then four years down the road, nothing, crickets," Jack said. Jack and Kramer say some positives Leavenworth has to help recruit businesses include the city's relatively close proximity to Kansas City International Airport, about 20 miles or a 30-minute drive, good schools and proximity to Fort Leavenworth. "The big selling point for this park is it's shovel ready and turnkey," Kramer said. But Leavenworth is trying to recruit businesses for the new park right as a major tenant in the neighboring Gary Carlson Industrial Park may be leaving. The Veterans Administration is looking for an existing 100,000 square foot building for its Consolidated Mail Outpatient Pharmacy or CMOP, a regional drug shipment plant. That kind of building doesn't exist in Leavenworth. Jack said it took 20 years to get Carlson Park 75 to 80 percent full. Now a major tenant will likely be leaving. "If the VA winds up leaving, they'll end up leaving a 70,000 square foot building which will create another market," Jack said. If a company does come to the new industrial park, taxpayers likely won't know about it until it's a done deal. Companies typically don't give out their names as part of non-disclosure agreements when they're looking at different sites. "It's tough with the non-disclosure agreements in place. You don't know what company it is while you're in the negotiation part. We usually get information like light manufacturing. We get the number of jobs. We get the average salary," Kramer said. "One of the ones we were a finalist for was 40 jobs and about 12 to 15 acres," Kramer added. The 41 Action News Investigators asked Kramer and Jack about the long-term prospects for the park's success. "I wish I had a crystal ball. We're hoping to capitalize off of what they do at the fort, maybe what they do at the VA," Kramer said. "Long-term, we want something like the adjacent 80-acre park, the Gary Carlson Park, where 500 people go to work every day," Jack said. Nearby Tonganoxie also has a new industrial park. While that park isn't completed with full grading and utility hookups like the Leavenworth park, it has lined up a new tenant. Unilock , an Aurora, Illinois company which makes landscaping pavers, has committed to a 34-acre lot in the Tonganoxie Park. The plan is to use that land for a yard to store pavers and then build a new manufacturing plant in 3 to 5 years.